Philadelphia Building Inspector Ronald Wagenhoffer, 52, was found dead in his truck after 9 p.m. Wednesday night. Wagenhoffer inspected the four story building that collapsed last Thursday in downtown Philadelphia that killed six, including one of the businesses shop owners. 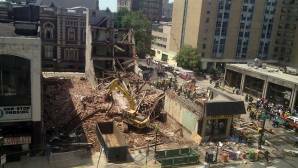 The city is currently facing much criticism for not inspecting the demolition site where the building collapsed. Gilson tells the press that Wagenoffer did nothing wrong, he had only done his job. Co-workers state that there did not seem to be any disturbance in Wagenoffer’s behavior. He continued to come to work, and continue his regular duties. The commissioner of buildings inspection department made an attempt to reach out Wagenoffer, but had not gotten the chance to speak to him. Gillison also emphasized that Wagenoffer was not being targeted in the investigation, but a construction crew member had been arrested for allegedly operating a crane under the use of controlled substances when the buildings collapsed. To read more on this story, visit abcnews.go.com.